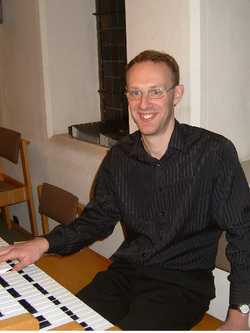 Colin is our highly skilled and respected Accompanist. Working alongside Jeff, he provides our accompaniment on Tuesday evenings, as well as performing at our concerts. Colin was born in Aylesbury, Buckinghamshire and educated at Aylesbury Grammar School, and studied organ with Stephen Armstrong. In 1994 he was appointed Organ Scholar of Brasenose College, Oxford, where, in addition to reading for his degree in Classics, he also received organ tuition from Stephen Farr and David Goode and was responsible for the music in the College Chapel. On graduating in 1998 he was appointed Organ Scholar of Gloucester Cathedral under David Briggs and Ian Ball. There he participated fully in accompanying the Cathedral services and training the choir. Since November 2000, he has been Director of Music at St. Mary-le-Strand, where he directs two professional choirs. He combines this with the part-time role of Organist and Director of Music at St-Dunstan-in-the-West. He works frequently with Chantage, choir of the Year in 2006, and the chamber choir, Ad Libitum. As a conductor, Colin directed Wingrave Singers from 2000-2009, before becoming the choirs organist. He has been Musical Director of Music at Thame Choral Society since 2008. He also enjoys working as a repetiteur at High Wycombe Choral Society and the North Herts Guild of Singers, Hitchin, recently performing Durufle's Requiem in Burgundy. He is frequent demand as an accompanist in concerts throughout the South East, as well as the Netherlands, Italy and Australia. He is actively involved at the Jean Langlais Festival in Brittany, where, in 2011, he delivered a lecture and performed a duo recital with Claude Langlais.